Even the non-saved person such as Mr Schieffer knows and understands God’s hand upon the earth and on this nation. We have turned our back on God in all the ways possible and as a result, we are under judgment. God’s hand upon us is not one of soft care but hard abandonment. Romans 1:18-32 has the progression- we have had a sexual revolution, we then had a homosexual revolution, and now we have such reprobate minds we can’t even declare for certainty what our own biological gender is. The nation IS under a curse. Obviously the curse is so palpable that even the blinded mind can detect it. His reference of course is to the biblical plagues God sent upon the Egyptian Pharaoh who would not let the Israelite people go. 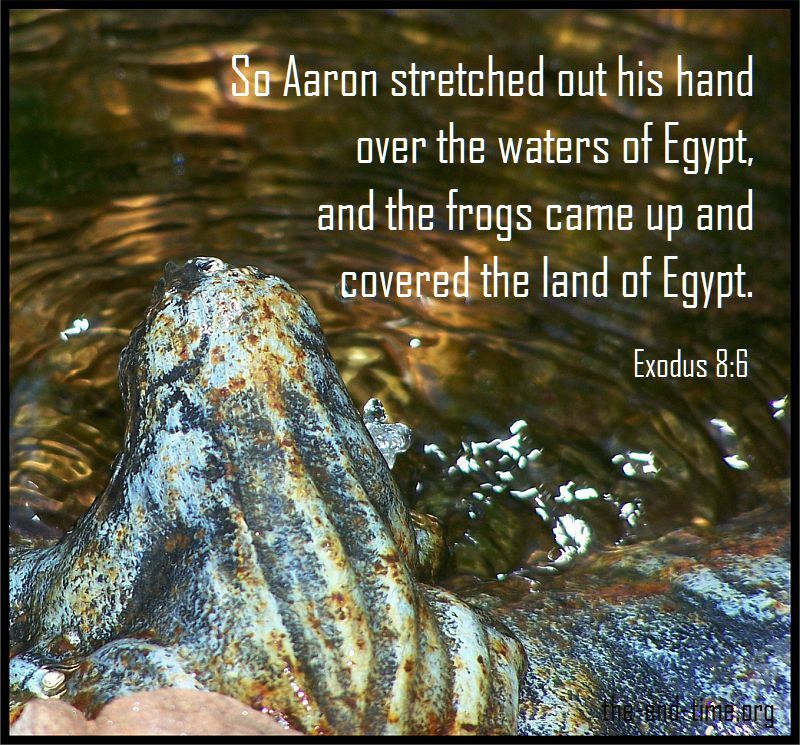 The plague of frogs was the second plague, as we read in Exodus 7:25–8:15. I surmise that Schieffer’s reference here is to the unnatural conditions one finds in the United States, as compared to previous elections and conditions upon which candidates had promised to fix. How interesting that when one comes up against an unnatural condition, one’s mind turns to the Bible and its plagues or other events in which to compare. It does feel different. Time will show just how different. It says a lot on how far down the judgment path this nation has traveled since 2008 when many, many folks detected an evil supernatural quality to Obama, so much so that lots of folks thought he was the antichrist. And now they are feeling this election with its crop of candidates is worse? That’s saying something. In Isaiah 19:11-12 we see that the nation’s wise men had become foolish, their wisdom vaporizing like dew on a warm day. They could not deal with the crises at hand and had become helpless to fix them. This is because they were ignorant that God’s judgment was the cause. If any of this sounds familiar, it should. These cycles of blessing and judgment have gone on since the Garden and they will until Jesus concludes His redemptive plan. Humans have always been either one of two things, sinful or righteous in God. If they are sinful they do not know God and worship the creation. Their foolish hearts are darkened and their minds cannot think correctly. If the people of a nation are righteous in Christ, they (we) submit to the temporal happenings with grace and good humor. Despite the hoopla over the US Presidential Election, God’s redemptive schedule is still on track. Nothing is hindering it, nothing is throwing it off balance or behind schedule. Even if frogs rain down on post-election morning, I will still praise my Savior for His grace and works. This nation is enduring a curse. However, His children are never cursed. Our standing in Him is made righteous through Christ, and our citizenship is in New Jerusalem. Presidents come and go, but our Ruler is eternally on His throne. Kiss the Son, lest he be angry, and you perish in the way, for his wrath is quickly kindled. Blessed are all who take refuge in him. (Psalm 2:12).